Aliosha Biz comes from a family of Moscow artists with Austrian roots. 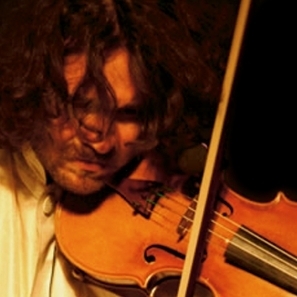 Before he left his place of birth in 1989, he studied violin at the Tschaikovsky Conservatory. Since then he has lived in Vienna, and though he visited the Music and Art College there, he was also discovered by Vienna’s cultural scene in the “Academy of the Streets.”Aliosha feels a special love for all facets of Jewish music. It is thus not surprising that he has been approached by the most important ensembles and interpreters dealing with this tradition in Austria: Timna Brauer, cantor in-chief Schmuel Barzilai, Lena Rothstein, Albert Thimann, and the Freijlech and Sholom Aleichem Klezmer ensembles. Moreover, he is a very sought-after theater musician with ambitions as an actor. This is evidenced by his projects with Gerhard Bronner, Adi Hirschal or Karl Merkatz and in various theaters (Theater an der Wien, Landestheater Linz, Burgtheater etc.). He has played with Dhafer Youssef, Alegre Corrêa, Lakis & Achwach, the Acoustic Drive Orchestra, and for the Jacques-Brel-Revue with Maria Bill, to name only the most important of his projects.